I first came across mention of ‘Miss Luxmoore’ in the pages of Kate Frye’s diary. Obviously a suffragist, with a Studio at 57 Bedford Gardens, Campden Hill, I presumed she was an artist. But who was she? Her name is not recorded in, for instance, Lisa Tickner’s Spectacle of Women, the vademecum on suffrage artists. Intrigued, I thought it worth finding out more about Miss Luxmoore and her world. So, to begin at the beginning, here are three entries from Kate Frye’s diary in which she records meetings held at Miss Luxmoore’s Studio. Dinner at 7.30. Off at 8 o’clock to Bedford Gardens – Miss Luxmoore’s Studio to a Suffrage meeting. Got there in good time and started to work at once stewarding and trying to make converts. Got a young man student to join the Men’s League. Mr Mitchell and Miss Clementina Black were the speakers and did very well. Alexandra [Wright] was in the Chair. I waited at the end helped count the money etc and walked up to Notting Hill Gate with the Wrights and Miss Black and walked all the way home. Was not in till after 11 o’clock. Very much enjoyed the meeting and the Suffrage atmosphere and meeting all those students was like a page out of a book. I changed my dress had a bit of something to eat then off at 7.30. Walked to Richmond Road took a bus to Bedford Gardens and went to Miss Luxmoore’s Studio Suffrage meeting. Gladys was there. Mrs Graves took the chair. Miss Meyer helped and Mrs Stanbury spoke – but, besides ourselves, there were only 15 audience. Mrs Henry of the Camden Institute was there. I had sent her a card and she quite disgraced herself and made Mrs Stanbury very uncomfortable by hissing loudly, then walking out with her poor unfortunate daughter. Something Mrs Stanbury said upset her – she was only talking history but Mrs Henry took it to mean the Queen of Spain – but I could not understand it till I got home and found from Daddie that Mrs Henry has become a ‘pervert’ to the Roman Catholic Church. It made a nasty impression on us somehow. We had a chat afterwards and all got very low spirited. There has been another raid on the House – several arrests and the women much knocked about – it is all so awful. My research has shown me that ‘Miss Luxmoore’ was Myra Elizabeth Luxmoore (1860-1918), born in Paddington, the only child of John and Jane Luxmoore. By her first marriage, however, Jane had at least three daughters, Myra’s elder half-sisters. John Luxmoore worked for the Great Western Railway as a superintendent locomotive engineer. After a period based in Paddington, the family followed John’s work to Newport in south Wales and finally to Newton Abbot in his native Devon. By 1888, giving her address as Somerford, Newton Abbot, Myra Luxmoore was exhibiting as an Associate with the Society of Women Artists. By 1891 she had moved to London and was living at 32 Charlotte Street, Fitzroy Square. 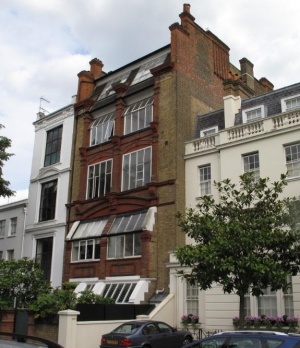 She then spent a brief time living at 87 Cadogan Gardens before moving, c 1905, to her studio at 57 Bedford Gardens. After that she began exhibiting regularly at the Royal Academy. Around 1912 Myra Luxmoore moved to 80 Redcliffe Square, Kensington, remaining there until her death in 1918. You can see from the photograph (above) that 57 Bedford Gardens had been purpose-built with artists in mind, with large windows to provide ample light. A google search shows photographs of the inside of the apartments as they are today – lofty spaces, providing ample room for a suffrage meeting. When researching suffrage boycotters of the 1911 census I was interested to note that, while the enumerator wrote in his book that Myra Luxmoore was the occupier of a studio at 57 Bedford Gardens, he marked the apartment as unoccupied on census night. Presumably she, along with several other of the artists who shared the address, had opted to spend the night elsewhere. Her distinctive name is to be found nowhere else in the census returns. 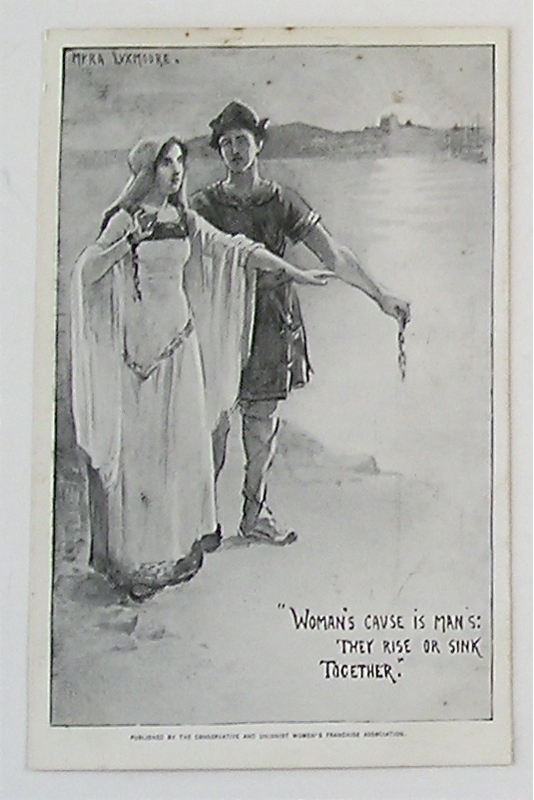 I had wondered where Myra Luxmoore’s suffrage allegiances lay and have recently discovered this card (left) illustrated by her and published by the Conservative and Unionist Women’s Franchise Association. I think, therefore, it would not be too far-fetched to think that she was a supporter of the CUWFA. Incidentally, as far as I remember, this is the only postcard issued by the CUWFA that I have ever seen. 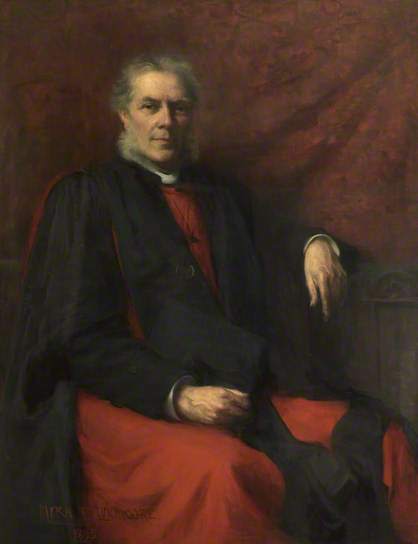 One portrait by Myra Luxmoore is known to hang in a public collection, that of the Very Rev Edward McClure (1833-1906), Dean of Manchester. Other of her works were collected by Mother Agnes Mason, Foundress of the Community of the Holy Family. Click here to read about her connection with Myra Luxmoore and her works. The article also gives some, unverified, information about the Luxmoore family’s friendship with the family of Gerard Manley Hopkins. Copies available from Francis Boutle Publishers, or from Elizabeth Crawford – e.crawford@sphere20.freeserve.co.uk (£14.99 +UK postage £3. Please ask for international postage cost), or from all good bookshops. In stock at London Review of Books Bookshop, Foyles, National Archives Bookshop. This entry was posted on February 4, 2013, 11:02 am and is filed under Kate Frye's suffrage diary, Uncategorized. You can follow any responses to this entry through RSS 2.0. You can leave a response, or trackback from your own site. I was searching for Myra Luxmoore today and I find something on your website, so lovely. I have a little portrait of her in colour. Behind the little painting you can read: Portrait of herself by Myra Luxmoore RMS. Exhibited R.A. RMS elswhere (I think … the last word is not clear). Can you tell me in what year she painted this? I like her style so much but I cannot find much of her. I’m a painter myself and I love art. Hello, Annemiek – how very interesting that you have a self-portrait of Myra Luxmoore. Alas, I do not know when she painted it. If you wanted to – you could send me a photo of the portrait and I could add it – with due acknowledgement to you as the owner – to the Myra Luxmoore piece. But I quite understand if you want to keep the image for yourself! I was looking through old family photos and found a little painting (abt 6″x4″) by Myra Luxmoore on card stuck to a light brown wooden veneer mount. The picture is in a black wash watercolour of the back view of two little boys, one in a sailor suit, sitting on the ground with a couple of very small toys (men on horseback). My grandmother’s family came from Newton Abbot so perhaps that is where the link is to be found. It may be of two of her brothers. Lovely to come across such things – and I hope my post tells you a little more than you might have known of Myra Luxmoore! I found your post so interesting and I am now having the small picture properly mounted and framed! Thanks for all your information. Delighted that my abstract research made contact with real life …as it were. Hello again! I have now found out that I am very very distantly connected by a marriage in the family to the Luxmoore family. Myra’s aunt, Caroline Luxmoore, married John Peter Hall, the brother of my great great grandmother! So that is the most likely reason for the connection of the little painting we have. I will try and find out about her now! From the British Newspaper Archives website, there is a letter Myra wrote to the Editor of The Standard, 26 July 1909, in which she states she is a member of the National Union of Women Suffrage Societies and also of the Conservative and Union Women’s Franchise Association. She also voices her feelings about women’s suffrage. There are many mentions in the 1890’s of paintings at the Royal Academy. In 1894 the portrait of Lady Frances Balfour was exhibited together with a drawing “hung on the line”. In 1904 she had a painting exhibited at the Paris Salon; and in 1906 several portraits with the Ridley Art Club exhibiting at the Grafton Gallery. In 1904 there are 8 illustrations published in a book entitled “The Sons Cormac an’Tales of Other Sons” (Irish Legends). Her illustrations also appeared in several magazines including the Ladies Home, The Sketch and the Sunday Magazine. She was brought up in a household full of women since her father John Tonkin Luxmoore died when she was eight and besides her mother there were several older half-sisters, her only brother having died when he was five and she three years old. Although her father was a railway engineer most of his family were solicitors. She also had an uncle, Percy Putt Luxmoore, who was a Rear-Admiral much decorated for his services. I am probably duplicating what you already know.